It’s been years now, and I’m not anywhere close to being ‘over’ steampunk. The aesthetic lends itself to adventure, to invention, and apparently to the hands of some of the best writers around. One of the most popular steampunk authors is Gail Carriger, whose novel Soulless I lovedLOVEDloved. Well, now she’s doing all of her fans the enormous favor of writing a YA series. I don’t know when I’ve heard such wonderful news – this is great for the genre, great for books, and I can tell, just from the cover and description (despite a lack of obvious steampunk), that it’ll be rollicking good fun. Plus, the name Sophronia? It can only bode well. 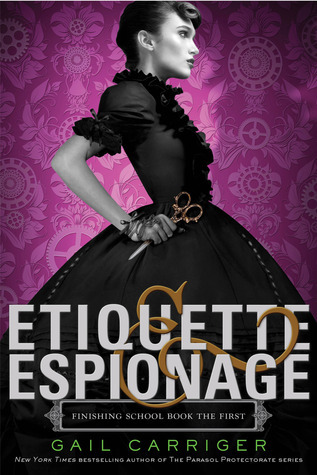 Etiquette & Espionage by Gail Carriger will be published by Little Brown (Hachette), and releases on February 5th, 2013. Fourteen-year-old Sophronia is the bane of her mother's existence. Sophronia is more interested in dismantling clocks and climbing trees than proper etiquette at tea—and god forbid anyone see her atrocious curtsy. Mrs. Temminnick is desperate for her daughter to become a proper lady. She enrolls Sophronia in Mademoiselle Geraldine's Finishing Academy for Young Ladies of Quality. But little do Sophronia or her mother know that this is a school where ingenious young girls learn to finish, all right—but it's a different kind of finishing. Mademoiselle Geraldine's certainly trains young ladies in the finer arts of dance, dress, and etiquette, but also in the other kinds of finishing: the fine arts of death, diversion, deceit, espionage, and the modern weaponries. Sophronia and her friends are going to have a rousing first year at school. I cannot wait to read this! I haven't read her adult series, but I've always heard amazing things about it. Such a cool cover, too---I adore the scissors! Ohh, I love this cover and the book sounds like a fun read. Every time I see somebody WoW this I get even more excited, which is saying something, considering I'm at the highest level of Carriger fangirl that one can get. Definitely sounds like it would be a pretty good read. Good choice. Okay, that definitely sounds awesome and very, very interesting. I'd love to get my hands on it when it comes out. Great pick, I'm adding it to my to-read list right away. I am so freaking excited for this one. I love Gail Carriger and can't wait to see what she does with a YA. I want to read this one. I enjoy the Soulless series and this sounds even better. The cover is lovely! The purple color, the scissor in her hand; I really like it ^^ And the blurb sounds pretty good too! The cover is pretty. Sounds great! Can't wait to pick this up! July To Be Read Pile: Help Me? Vote here!